Sophia Snow Leopard Squeaking Dog Toy is an exciting toy from the Animal Instincts' winter collection "Snow Mates". This delightful furry toy is made from a premium, extra soft fabric which makes it great for warm snuggles with your pet. An added squeaker can be found in the stomach of this super soft comfort toy for maximum entertainment. 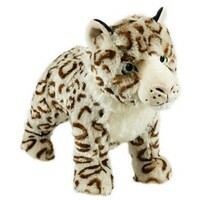 As well as snuggling up, Sophia Snow Leopard is ideal for playing, fetching, tugging and chewing. Please Note: This toy is not designed for excessive chewers. This is a great toy and is good quality as it is fully in tact even though our flat coat plays with it every day! A great puppy toy, my puppy loves to chew and play fetch and snuggle up with this toy.